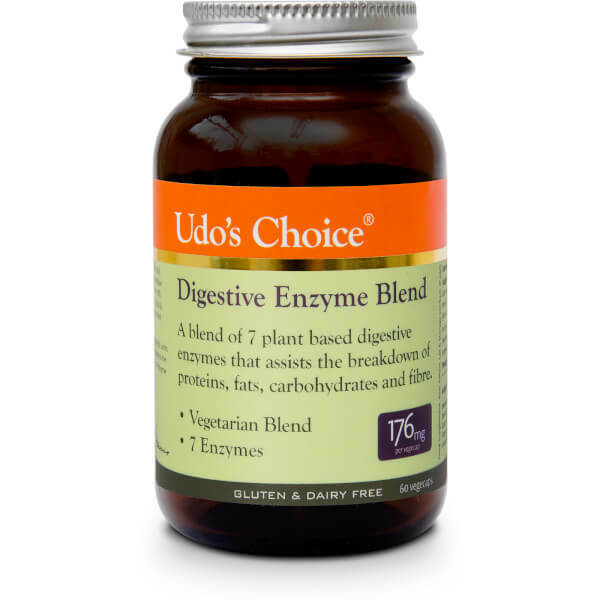 Udo's Choice Digestive Enzyme Blend is a carefully selected cocktail of 7 plant based digestive enzymes that have been encapsulated in an easy-to-swallow capsule to help aid healthy digestion and nutrient absorption. Digestive enzymes are important because they break down the foods we eat for our bodies to then absorb. All too often, naturally occurring enzymes are lost during the preparation and cooking process, which can be detrimental to our health. To help combat this, the capsules combine a carefully balanced selection of digestive enzymes to help replace lost enzymes and aid full digestion of fats, carbohydrates, protein and fibre. Helping to reduce bloating and digestive complaints, the capsules expertly break down and metabolise every food type to ensure your insides feels happy and comfortable. Consume 1 capsule before meals, or as directed by your health care practitioner. For heavy meals: consumer an additional capsule during the meal. Capsules can be opened and the contents sprinkled over food if desired (do not take with very hot items as enzymes are heat sensitive). In case of ulcer, do not take on an empty stomach. Do not exceed the recommended daily intake. Food supplements should not be used as a substitute for a varied diet. Store in a cool, dry place, and out of reach of children.